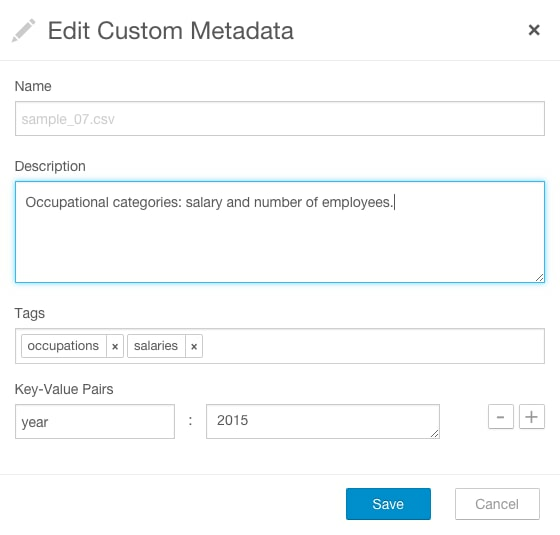 You can add and modify the following custom metadata associated with entities: display name, description, tags, and user-defined name-value pairs using the Navigator Metadata UI, MapReduce service and job properties, HDFS metadata files, and the Navigator Metadata API. Run a search in the Navigator UI. Click an entity link returned in the search. The entity Details tab displays. To the left of the Details tab, click Actions > Edit Metadata.... The Edit Custom Metadata dialog box drops down. You can specify special characters (for example, ". ", " ") in the name, but it will make searching for the entity more difficult as some characters collide with special characters in the search syntax. You can associate custom metadata with arbitrary configuration parameters to MapReduce jobs and job executions. The specific configuration parameters to be extracted by Navigator can be specified statically or dynamically. Select Scope > Navigator Metadata Server. Click Navigator Metadata Server Advanced Configuration Snippet for cloudera-navigator.properties. nav.tags = comma-separated list of property names that serve as tags. The property nav.tags can point to multiple property names that serve as tags, but each of those property names can only specify a single tag. In the MapReduce job configuration, set the value of the property names you specified in step 6. The properties nav.job.tags and nav.jobexec.tags can point to multiple property names that serve as tags, but each of those property names can only specify a single tag. In the MapReduce job configuration, set the value of the property names you specified in step 1. "prop1" : "value1", "prop2" : "value2"
File - The path of the metadata file must be .filename.navigator. For example, to apply properties to the file /user/test/file1.txt, the metadata file path is /user/test/.file1.txt.navigator. Directory - The path of the metadata file must be dirpath/.navigator. For example, to apply properties to the directory /user, the metadata path must be /user/.navigator. The metadata file is applied to the entity metadata when the extractor runs. You can use the Cloudera Navigator Data Management API to modify the metadata of HDFS or Hive entities whether or not the entities have been extracted. If an entity has been extracted at the time the API is called, the metadata will be applied immediately. If the entity has not been extracted, you can preregister metadata which is then applied once the entity is extracted. Metadata is saved regardless of whether or not a matching entity is extracted, and Navigator does not perform any cleanup of unused metadata. The metadata provided via the API overwrites existing metadata. If, for example, you call the API with an empty name and description, empty array for tags, and empty dictionary for properties, the call removes this metadata. If you leave out the tags or properties fields, the existing values remain unchanged. Modifying metadata using HDFS metadata files and the metadata API at the same time is not supported. You must use one or the other, because the two methods behave slightly differently. Metadata specified in files is merged with existing metadata whereas the API overwrites metadata. Also, the updates provided by metadata files wait in a queue before being merged, but API changes are committed immediately. This means there may be some inconsistency if a metadata file is being merged around the same time the API is in use. All existing naming rules apply, and if any value is invalid, the entire request will be denied. If you have multiple services of a given type, you must specify the source ID that contains the entity you're expecting it to match. HDFS file or directory: fileSystemPath of the parent directory (do not provide this field if the entity being affected is the root directory). Example parentPath for /user/admin/input_dir: /user/admin. If you add metadata to a directory, the metadata does not propagate to any files and folders in that directory. 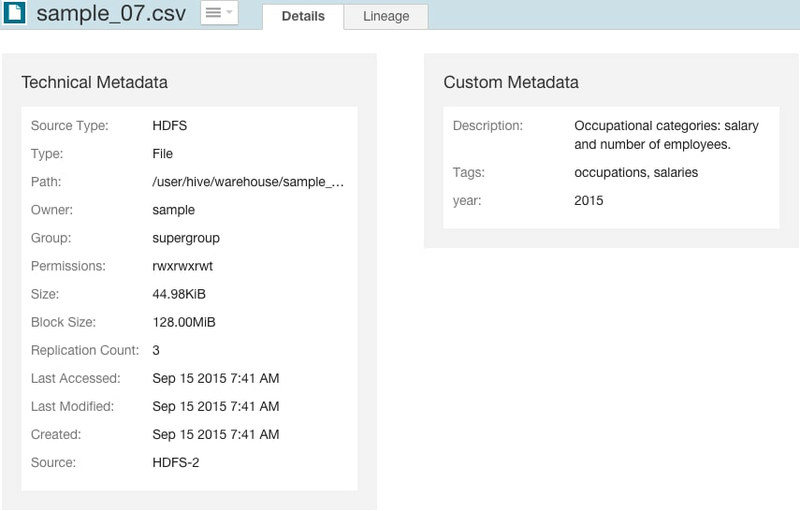 Hive database: If you are updating database metadata, you do not specify this field. Hive table or view: The name of database containing the table or view. Example for a table in the default database: default. Hive column: database name/table name/view name. Example for a column in the sample_07 table: default/sample_07. originalName (required): The name as defined by the source system. HDFS file or directory: name of file or directory (ROOT if the entity is the root directory). Example originalName for /user/admin/input_dir: input_dir. Hive database, table, view, or column: the name of the database, table, view, or column.